Cheers to all who came out to The Jazz Bar last night. I think it’s safe to say it was one of our favourite gigs ever… After all playing lots of other gigs elsewhere beforehand, there was a touch of catharsis for us all going on on stage. But your dancing sweaty bodies justified so much of what we do. Thank you. That’s our last gig for a little while – people are going travelling, and we’ve got lots of new ideas to work on, so we’ll see you once more in February. But before we hibernate. Here’s one of our newer tracks which we laid down live earlier in the year with the help of producer Graham Coe (also one half of The Jellyman’s Daughter). Enjoy. 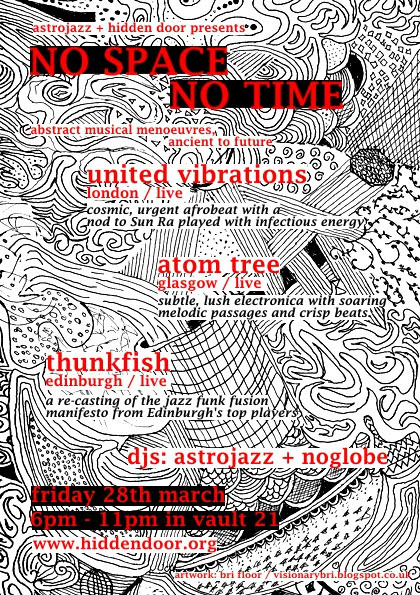 We’re very excited to announce that we’re going to be playing for the opening night of the Hidden Door festival at the end of March, alongside Atom Tree and United Vibrations – curated by the excellent Astrojazz (who also bring you Wee Dub festival and Kelburn Gardn Party). This is gonna be a really unique event, something very special, and the whole thing is on for 9 days, with 40 bands, 70 artists and a bunch more stuff happening in 24 disused vaults on Market St, Edinburgh. We’ll try and make this one extra special for you!